Memorial Day Weekend Oil Change Savings! 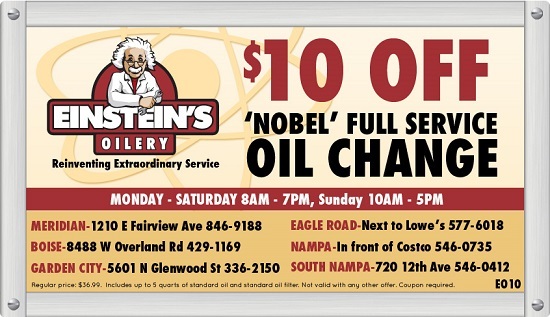 Get ready for the road this weekend with a ‘Nobel’ Full Service Oil Change and save $10 with our online coupon! Simply present the coupon above on your mobile device at the time of service to receive your discount. Or get a printable coupon here: Oil Change Coupon. No appointments ever needed! Plus, at Einstein’s you can relax in your car with a FREE newspaper, beverage, and Wi-Fi while you watch your service performed live on TV! Idaho Gives This Thursday, May 5th! Idaho Gives is a one-day online giving blitz. It is about philanthropy, ‘friendraising’ and much more. 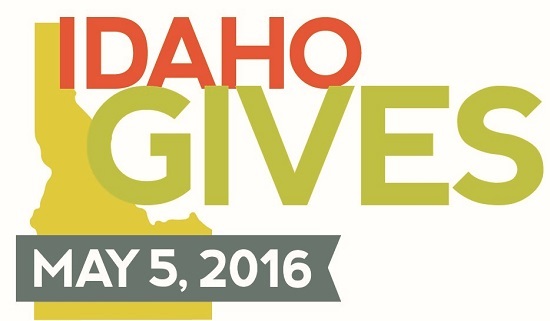 Idaho Gives is about coming together to support the charitable nonprofits that make our state so extraordinary. On May 5th, thousands of people will show their support for Idaho’s nonprofits by making an online donation through the Idaho Gives web site (www.idahogives.com). Donations will have an even greater impact thanks to a pool of award money provided by generous sponsors and individuals. Help your favorite Idaho charity continue their work in our community by making a donation on May 5th! For more information visit: www.idahogives.com.